Asparagus has been a favorite of mine since back in the day when we picked it wild, growing along the side of country roads. Grilled, roasted, steamed, or stir-fried it is welcome at our table. Thankfully, it was one of the vegetables our kids would eat, though somewhere along our homeschooling journey they read that asparagus heads can be toxic and refused to eat them. They were happy to munch on the rest of the stem, but the tips were always left behind. Pretty sure it was the texture that turned them off, but they were adamant in their reasoning. It’s funny what stays with kids … not sure if they remember all the states and capitals, but the possibility of being poisoned by asparagus, stuck. Okay. Don’t eat the heads. Whatever. In the wide world of side dishes, roasted asparagus is my go-to side because it pairs well with grilled, roasted, or braised meats, and its distinct flavor needs little more than extra-virgin olive oil, salt, and pepper. Though traditionally served with hollandaise, which is glorious, it doesn’t have to have heavy sauces to be elegant. In this recipe, caramelized onions add a delicate sweetness and balance the tangy blue cheese, while pine nuts bring an extra dimension of texture. It is a simple, yet gorgeous dish for a dinner party or dinner with a few friends on the patio. Since the recipe starts with caramelizing onions, which takes an hour to reach deeply browned splendor, there’s lots of time to tend to the main course. I’m not even sure this should be called a recipe at all; it’s more like an idea, a notion of combining separate delicious things into a single bowl of inspired goodness. One more way to serve asparagus, one more way to enjoy caramelized onions, and one more reason to carve off a hunk of Blue cheese before it goes bad. (I’ve always wondered how anyone would know when Blue cheese went bad…) Blue, Gorgonzola, or feta cheese all work here—the amount is up to you. For information about storing, prepping, and cooking asparagus, check out my earlier post Asparagus: Coveted Spears of Spring. In this recipe, caramelized onions add a delicate sweetness and balance the tangy blue cheese, while pine nuts bring an extra dimension of texture. It is a simple, yet gorgeous dish for a dinner party or dinner with a few friends on the patio. Position top oven rack approximately 12 inches under broiler and turn broiler on HI. Prepare asparagus by trimming fibrous ends, about 2 inches from the bottom. Discard ends and cut the remaining stalks into 2 inch pieces. Arrange asparagus on a rimmed baking sheet so it is spread out a little without crowding. Drizzle with oil and using your hands, roll asparagus to coat well. Season with salt and pepper. Set asparagus under the broiler for 10-12 minutes, checking every few minutes until lightly browned in spots and crisp tender. Cook slightly longer if a softer texture is preferred. While asparagus is roasting, toast pine nuts in a dry skillet over medium heat, rolling them around, until lightly browned in spots. 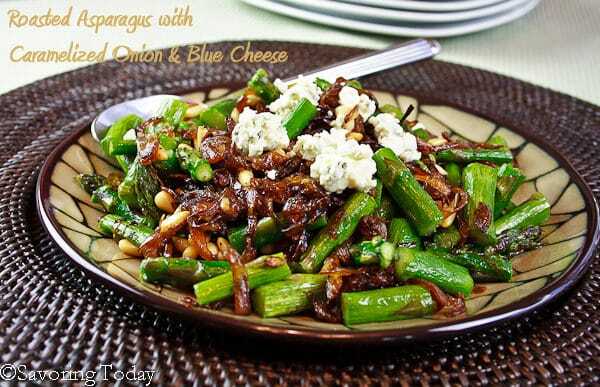 When tender, toss asparagus with onions, pine nuts, and blue cheese, as desired. Serve immediately. 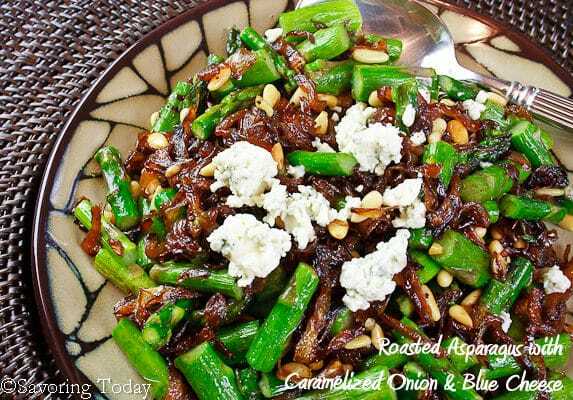 Sweet and sticky Caramelized Onions perfect with roasted asparagus and blue cheese. Heat olive oil and butter in a cast iron skillet over medium heat until oil covers the pan evenly and is hot. Add the sliced onions and stir enough to coat the onions with the oil and butter. Continue to cook onions over medium heat, stirring occasionally until onions begin to brown, about 10 minutes. 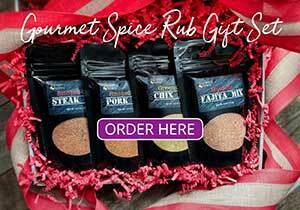 Season with 1/2 teaspoon of salt and unrefined sugar, spread onions evenly over bottom of skillet, reduce heat to low. Allow onions to gently caramelize over the next hour, stirring occasionally to ensure they caramelize evenly. Onions should be deep, golden brown when done. When using Vidalia, Maui, or other super sweet onions, omit any sweeteners, as they are not necessary. There is no exact time when the magic happens, some let onions caramelize for up to 2 hours. Caramelized onions can be stored in the refrigerator for up to 1 week or frozen until ready to use. I had a dish just like this I think years ago and I’ve been trying to find a recipe to re-create the magic and I think I have found it with yours! I did have a question about the pine nuts. I couldn’t find in your recipe how you incorporated the pinenuts. Do you just bake them along with the asparagus for the 12 minutes or do you sauté them with the onions or simply toss them in as is at the end? Oh my goodness, thank you, Primavera, for bringing that to my attention! I have fixed the recipe to include the final instructions. 🙂 I do hope you’ll come back to let me know how you liked it. Your post gave me a real chuckle reading about your kids thinking about being poisoned by an asparagus tip. Great that they liked the stalks and that you got the tips…I’d make that trade too. We love asparagus and I like your recipe, I always like to learn a new way to serve it. Karen, that just shows you had more to say. 😉 I appreciate that you take the time to say hello and comment — always good to hear from you. Well, call it a recipe, an idea or a even a concept, this dish is making an appearance on my table soon. It looks wonderful! Fantastic recipe, well except I don’t eat blue cheese, no matter, I can easily swap that out with something a little lighter. I love asparagus. Scrumptious. Have a super day Judy. Judy, we are coming into asparagus season now! Bookmarking this beautiful recipe. Oh good! Asparagus season means springtime around here ~ love the new life of spring! What a delicious side dish! The caramelized onion with the bleu cheese sounds wonderful! I am not a big blue cheese fan but and a big asparagus fan – what a fantastic dish – I could always sub the cheese out with something a little milder. I know, right?! Absolute silliness, but it turned into an inside joke after a while. Life at the table is like sometimes. Thanks Smidge! Hope your week is going well. I love this recipe, and especially the addition of pine nuts! Looks delicious! I love asparagus 😉 thanks for sharing! The photo alone makes you want to prepare this…love the mixture of flavors and textures. 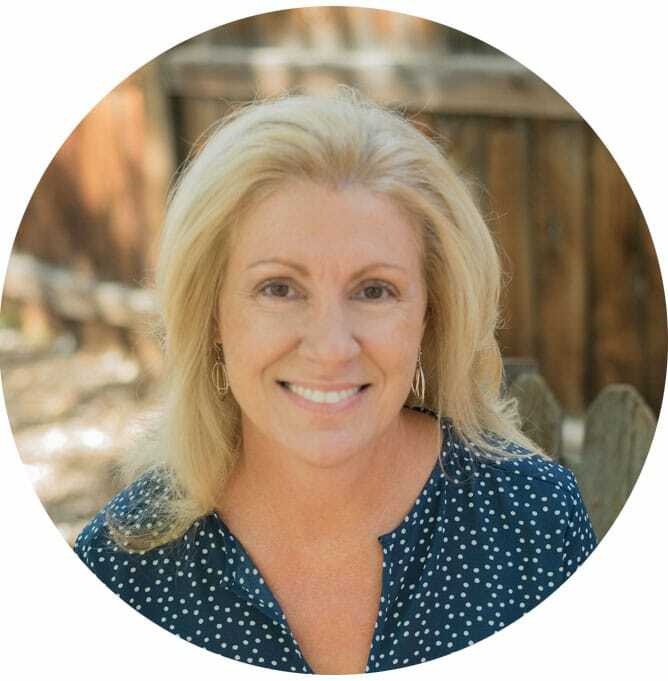 Thanks Karen, been working on the photos … that is what we want right?! I’d take the whole plate and call it dinner. I love this! I look forward to asparagus season almost as much as peach season in the summer … so yum!